When Lee Miller photographs the debris of buzz-bombing, she labels what she sees like a taxonomist. 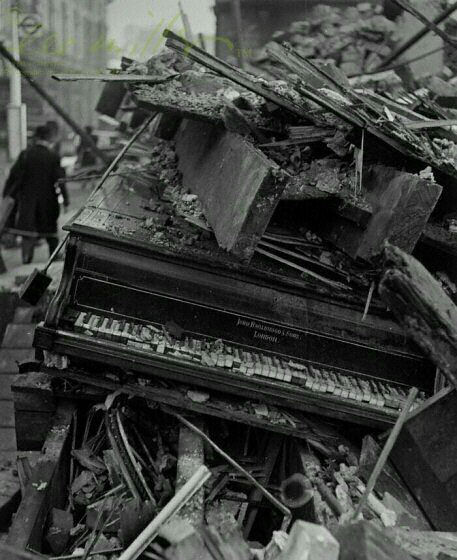 Here you have a Broadwood piano under rubble, and she titles the picture “Piano by Broadwood,” London, 1940. 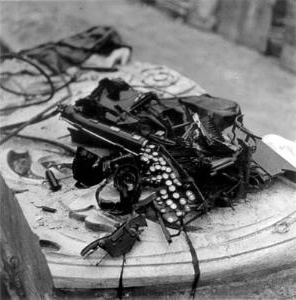 That’s all you need, but she extends herself ever so slightly in a similar picture of a typewriter, Remington Silent. After the victory she has her picture taken in Hitler’s bath, and snaps various SS guards and Nazi town officials who are dead by suicide or other means. She plants her tripod just inside a ruin and calls it what it is, Cologne Cathedral.